This post was originally written for a multi-media ministry called Servants of Grace, posted last week. So thankful for them and the way they have worked with me graciously. You are not alone. There are days in which the journey is long and wearisome, but you are seen. Your church needs you, and I am so glad that you responded to the call of seminary with a heart that says, “Here am I, send me.” In the midst of the chaos seminary can truly be at times, I hope that you hold on to that call as an Ebenezer, a mark that proclaims, “He who calls is faithful.” (1 Thessalonians 5:24). There are many warnings for us who find ourselves in seminary. Within those warnings lie deep seeded idols to be weeded out, pruned by our loving Father. As we pursue after the heart of Christ, the ultimate example for us in ministry and the whole of our lives, laying His life down for His sheep, we submit ourselves to not only grow in knowledge, but to grow in utter dependence upon Him for all things. The warnings that follow are not to trample anyone down underneath the heavy weight, but to exhort you to place yourself at the feet of He who calls you to be holy as He is holy. These are the words of Jesus Christ Himself. These words are never to be taken lightly. If you have found yourself going into seminary, found there not to be bound to these specific mandates, the call to be both a disciple and to make disciples; you may be in seminary for the wrong reasons. Seminary is not necessary to be a disciple. Yet, if seminary is where you find yourself, it certainly should be for the explicit purposes of building His church. Going to seminary is secondary to your call to come and die to live abundantly in Christ alone. Check your heart through God’s Word and in prayer for ways you may have a personal agenda before the call to be a disciple in your journey through seminary. There is such a gift in going to seminary that gets to be expressed by diving deeper and deeper into God’s words for many hours a day. 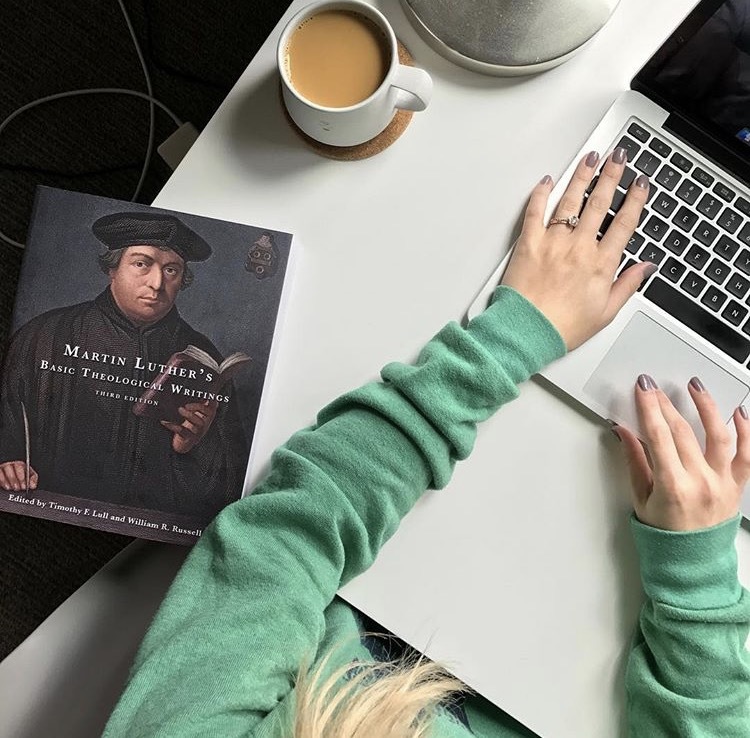 There is so much glory to be found in the biblical text that you will be poring over, spending much of your time debating, studying, and writing about it. The warning found here is that sometimes an overwhelming amount of knowledge can desensitize you to beholding it as a gift. The danger of head knowledge is that sometimes this head knowledge stays put only in our minds. We have already covered loving God with all of our minds, but if our mind doesn’t translate into heart change, we are missing something tremendous. Our theology must pour out into doxology. These very many “aha” moments of blessed assurance should be cause for rejoicing and transformation. It is so easy as you study to forget the gift it is to spend ample amount of time learning about Him in Scripture and how to love His people well. Check your heart for ways in which you have stopped depending upon the Holy Spirit to guide your time in His Word, asking Him for His wisdom, and not just trusting your newfound skills you’ve learned while in seminary. Another danger found in seminary that can lurk around every corner is the idolatry of knowledge. The pursuit of knowledge for knowledge’s sake can quickly change into a pride in your knowledge. What doesn’t help with this idolatry is the way that we as humans look still for a king, even when the Lord has made Himself known through His Word. Instead of grounding ourselves in our identity in Christ, people time and time again have placed one another on a pedestal. Knowledge that benefits others, a phenomenal gift of time in seminary, can quickly turn sour and make you the savior, a false god to behold. Being in seminary should not elevate you above anyone else. Being a leader in the Kingdom of God means that you bring yourself to the lowest seat, washing the feet of those around you with the gifts you have been given, which also means your education. Check your heart for pride that may have found ind it’s way into your life. Check your heart for ways in which you may be pointing to yourself as the source of where to find Christ, instead of Christ Himself. You may not be in seminary yet, but you might be thinking about attending. All of these warnings may be frightening, and they should be. “Not many of you should become teachers, for you know that we who teach will be judged with greater strictness.” (James 3:1) No matter the context in which you find yourself sharing the great gift and wealth of substance found in your countless time in God’s word, you should find yourself spending the same amount of time on your knees bringing it before the Lord as an offering, praying He would speak mightily through you. While I paint what looks like a bleak picture, I can never forget the beauty that has come in all of my time spent devoting myself to Him through seminary. There have been many days where I am weak, and it feels like I may be too weak to continue wearing the many hats that students in seminary also put on at the same time. In that weakness, Christ has been and will always be glorified. The opposites of all of those many warnings bear great and tremendous fruit in the lives of those who find themselves wholly dependent on Christ alone. May seminary for you, and for all, be a place where Christ becomes greater, and we all find ourselves lesser.